He said it would be carrying "dirty tar sands oil." 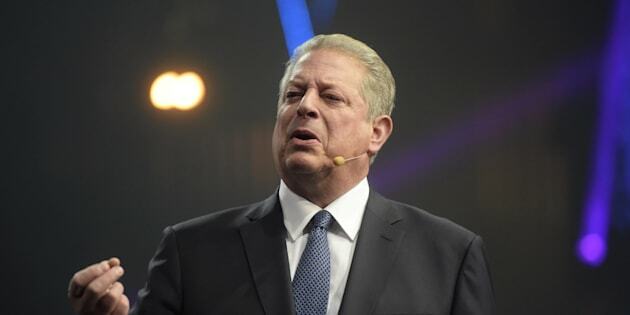 Former Vice President of the United States, Co-founder and Chairman of Generation Investment Management, Senior partner at KPCB Al Gore speaks during Slush 2017 startup and technology event in Helsinki, Finland, on Nov. 30, 2017. VANCOUVER — Former U.S. vice-president Al Gore says the Trans Mountain pipeline expansion is destructive and should be stopped. The environmentalist posted a tweet Thursday saying the pipeline carrying "dirty tar sands oil" would be a step backward in efforts to solve the climate crisis. Tar sands is considered a derogatory term by some for the oilsands in Alberta. Gore says he stands with B.C. Premier John Horgan, Vancouver Mayor Gregor Robertson and all of the other Canadians, including First Nations, who are fighting to stop the pipeline owned by Kinder Morgan. The pipeline expansion would triple the flow of heavy oil products from Edmonton to Burnaby, B.C. Alberta Premier Rachel Notley said Thursday she's confident talks aimed at getting construction of the pipeline expansion back on track will be successful before a May 31 deadline. Notley says she can't divulge details of talks with Kinder Morgan, but they are focused on the financial viability of the $7.4-billion project and on getting construction restarted this summer. Alberta and Prime Minister Justin Trudeau's government are in discussions with the company to strike a joint financial arrangement to ensure the project gets built. Trudeau's government approved expansion of the Trans Mountain line in 2016, but the B.C. government has been fighting it. Last month, Kinder Morgan stopped all non-essential spending on the project and said it wants assurances by the end of this month that the expansion can proceed.